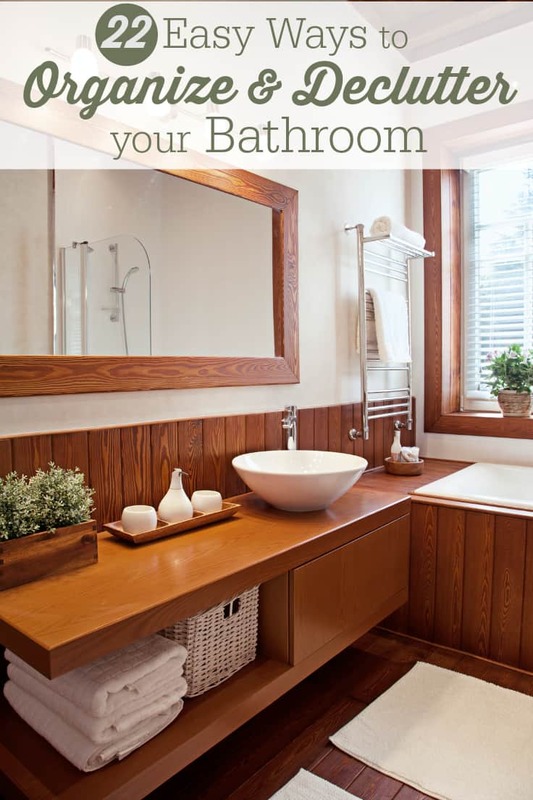 You’re ready to declutter the bathroom? Great! Start by throwing out any products that are expired, or haven’t been used in months. Nix the duplicates – you don’t need three half empty bottles of peroxide. So, combine them into one container and get rid of the rest. If you’re really ready to cut back, make a list of the items you use on a daily basis. Then, a weekly basis. If it isn’t used weekly, unless it’s part of the first aid kit, it can find a new home. Even though ponytail holders seem to disappear on a daily basis, is it really necessary to have 300 of them? Nope. Of course, if you have a ton of room, you can always keep extras on hand, but if you’re wanting to declutter, it’s time to cut back a bit. Use these ideas for bathroom organization inspiration. 1. If there’s space, install shelves over the toilet. They can hold towels, or toiletries. 2. Visit your local dollar store and stock up on small closet organizing containers, if you’re lucky enough to have a closet in the bathroom! 3. Control your hair care products. We’ll talk about the other stuff later, but we all know it’s probably way past time for this one. Take a look at all of the hair sprays, gels, glues, frizz products, etc and see which ones you really use on a regular basis. Say goodbye to the rest. No exceptions. 4. Understand that some items will just sit under the sink, because you only need them a few times a year. That is okay! 5. Use a toothbrush holder. Because, germs. Got a makeup problem? Take care of it with these awesome makeup organizing ideas. 6. Totally stuck on this magnetic makeup board! 7. Nice way to organize and display your makeup brushes. 8. Loving how they repurposed candle jars. 9. This tin can makeup display seems simple enough. 10. Utilize wall space! Hang your earrings. 11. Craft a makeup roll case. Great for travel, too! 12. Run out of magnets? Try a velcro makeup holder, made out of a picture frame! 13. Mason jars are a big hit right now. Use them to organize your makeup brushes. 14. How clever. A drawer within a drawer! 15. Use a spice rack to store nail polish or other small containers like foundation and lip stick. Not enough room? Try these tiny space hacks. 16. Get rid of duplicates. I know I said this above, but now I am talking about shampoos, conditioners, body washes, loofahs, etc. If you have a collection of these things, figure out which ones are necessary and get rid of the rest. 17. Install magnetic strips on the wall, to house tweezers, nail clippers, bobby pins, etc. 18. Get a shower curtain with pockets to save time and space! 19. If there’s room, install a shelf above the door. Use it to store extra towels, or even toilet paper. 20. Use an over-the-door shoe organizer for things like body wash, shampoo, etc. 21. Don’t stop with just one! Hang multiple towel bars in the bathroom. You’ll save space in your linen closet if you hang a handful of towels and washcloths on the bars instead. 22. Use a hanging fruit basket to organize washcloths, lotions, and other small (not too heavy) items. What are some of the things you do to control clutter and keep your bathroom organized? I find that no matter what I do, my guys will always work against me…. Great tips here! Love the idea of a shower curtain with pockets. Thank for all the great tips! I really need to get more organized. Thank you ! I need to organize my bathroom, thanks for this. Those little plastic containers are great for all kinds of things, and I love having a shelf in the bathroom. We have an over the toilet organizer with shelves, and it is great. Also a tower toilet roll holder keeps them handy and out of the way at the same time. Awesome tips for makeup organization. That’s where our mess is. A lot of awesome tips here, never heard of a shower curtain with pockets before, that would be interesting!! I use baskets under the sink to hold supplies. I try to declutter the shelves regularly. I should be doing it again soon. I like all your ideas and hope to implement some of them at least. Thank you for the tips! My bathroom is out of control and mostly because of all my hair care products and make up (yes, I am the guilty party). I will definitely take your tips and employ them! i love this!! i’m always looking for tips to declutter! you are so totally speaking my language. I was brought up by an organized mother, thank god because I tend to be a scatterbrained artistic type. With all her tips, I can’t stand a disorganized space, it makes me all discombobulated. Great tips by the way. So many of them I already use. My biggest rule is one in – one out and also if you haven’t used it in a year and have forgotten you had it then you don;t need it! One of our bathrooms is very small and I now see that I can use some of your ideas to better use our space. Thanks! Okay, I’ve been putting it off long enough – I’m going to clean out under the sinks! Sigh. I just did this the other day and threw out as bunch of things I hadn’t used or finished in the last 3 years. Very therapeutic…and a great looking bathroom at the end of it! Love the magnetic board for makeup and the Shower curtain with pockets. My cats are constantly knocking everything over, so this would eliminate that! It is so easy to let our “stuff” overwhelm us. Thanks for the great tips. Thank you for sharing these great tips! I don’t like clutters! Great tips. Thanks very much for sharing. I think I may just use these ideas!! Thanks for the tips!